For those of us not fortunate enough to have an unlimited data plan for our iPhone, there is a handy way of keeping track of your data and even receiving push notifications to warn you of data caps and overages. DataMan allows you to not only get access to detailed info on your daily, weekly, and monthly data usage, but also allows you view hourly statistics. I know what you’re thinking, you can already do this by going to your iOS device’s Settings.app>General>Usage. However, this doesn’t help you if you are too careless to constantly monitor your usage. 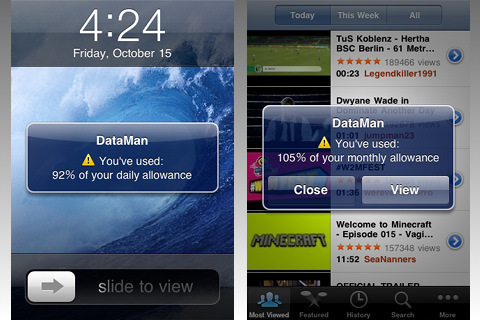 Luckily, DataMan will allow you to set alerts in the form of push notifications that alert you the second you exceed your data allowance. Dataman doesn’t require a carrier login and works worldwide. This makes it a great alternative for carriers that do not offer an AT&T myWireless or Rogers My Account style app for tracking data usage. 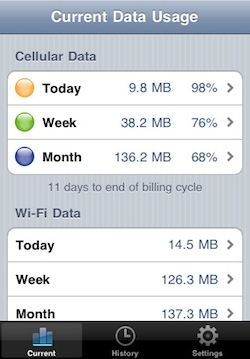 You can download DataMan ($1.99) for iPhone, iPod touch, and iPads running iOS 4.0 or later.